Love chili but not the beans? 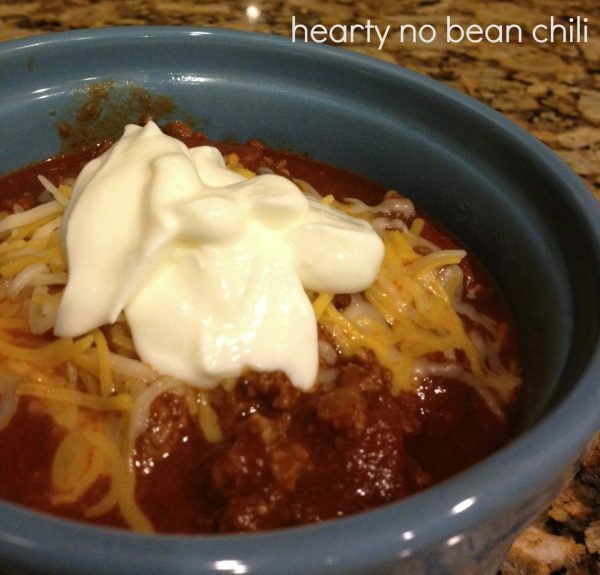 Then this Hearty No Bean Chili Recipe is perfect for you! If you’re like me, you love chili. I can eat chili anytime, even on hot, June days in Florida. It tastes good and it always produces leftovers which is great for during the week when you are busy with work and other projects. I usually make my chili with beans but I’ve been pondering making a no bean chili because, well, sometimes I just don’t like having the beans in it. So tonight I set forth and made a huge pot of no bean chili. This chili is loaded with beef, tomatoes, spices and even a few unexpected ingredients. I put this recipe together using ingredients from past recipes that I’ve used over the years. This chili turned out really well. It has a little spice but not too much. Please let me know if you make it and what you think! Over medium high heat, in a large pot, brown the meat along with the onions and jalapeno pepper. Break up the meat with a spatula into small bits. Drain the excess grease from the meat and return it to the pot. Add the remaining ingredients. Stir and let simmer for one hour. You may eat it before simmering but taste-wise, simmering for 1 hour is recommended. Garnish with onion, shredded cheese, sour cream or crackers (or all of them or any combination thereof.) Pairs well with corn bread or grilled cheese. Next Post » Ikea Lack Coffee Table Transformed! That looks amazing Julie! I'll have to try it sometime. :) I also grabbed your button for my blog! This looks really good! I rely heavily on recipes. =) Thanks so much for visiting at The Latest Find and for your kind comment! Now following your site, hope you're having a great week!! 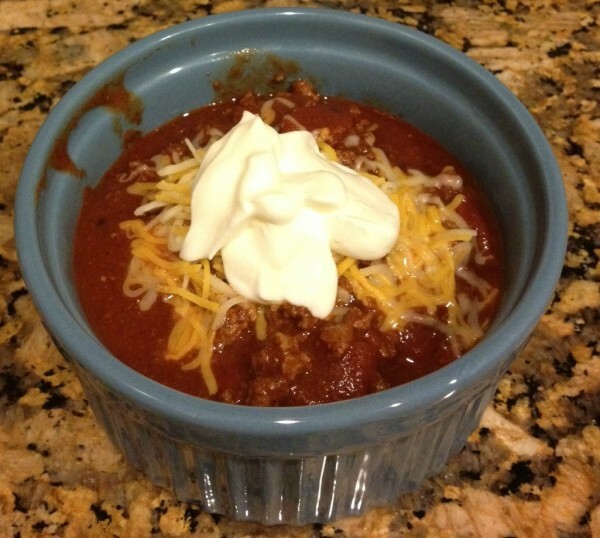 This is a great beanless chili recipe – I have made several times! It has a real depth of flavors! And is also fun to make. I used the good San Mariano canned tomatos this time ? I’m glad you enjoyed the recipe! Thank you for letting me know you did.